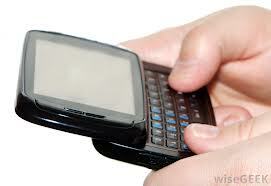 Are you or your clients feeling the effects of abuse from use of electronic devices in their hands, arms or fingers? Check out this article from Advance for OT “Protect Hands from Digital Distress“, by Cheryl McEvoy, providing tips and exercises to counter the effects of abusive texting and use of electronic devices. If you have pain during the activity, stop. Pain is one of the ways your body is letting you know that you are overextending a particular muscle group. Use a neutral grip when holding the device. A neutral grip is when the wrist is straight, not bent in either direction (not strong or weak). It will allow for wrist motion in a plane where more motion is available in the wrist. Take a break every few minutes or switch to another activity. Overuse of repetitive motions, such as pressing buttons, can cause tendonitis of the elbow or lead to Carpal Tunnel Syndrome (tendon or nerve irritation). If possible, place pillows in your lap and rest arms on pillows or use the device supported on a desk or tabletop. This will allow you to keep your head in a more upright position and therefore decrease neck strain. The pillows or desk will help support the arms so they do not have to be held up in the air. Sit in an appropriate chair. This is a chair that allows you to put your feet comfortably on the floor and also provides good back support. Switch hands frequently and vary the use of fingers/ digits. This will allow the one hand or other fingers/digits to rest and reduce fatigue. Frequently look away from the screen and focus on a distant object to help reduce eye fatigue. Advance for OT is a free subscription service and provides a monthly electronic and hardcopy magazine for Occupational Therapists. For years I have enjoyed the articles and information it provides as a professional source of information (for free). This entry was posted in Ergonomics, Medical, Occupational Therapy. Bookmark the permalink.